It’s been a roller coaster of a week here at the farm with quite a bit of loss. Our fall crops did not like the extreme heat we’ve had as of late and we lost many newly transplanted broccoli, cauliflower, cabbage and kohlrabi plants. It’s a bummer having to make the call to till under an entire section of the field due to so much devastation. We’re moving on but the reality is that this summer has had some really big obstacles for us. As much as I love farming for our livelihood, there have been many moments this season where I question our life path. Mother Nature can be one nasty B*tch and it’s been hard to keep up. The good news is that we we’re blessed with some cooler temperatures for a few days but it looks like we’re heating up again tomorrow. We’ll try and enjoy this break while we’ve got it! On a brighter note let’s talk about granola! This recipe was a happy accident. Taylor requested a new batch of homemade granola this past weekend and as I was getting out all the ingredients for my favorite recipe I realized we were out of oats. The horror! I didn’t have time to run to town for one ingredient so I persevered without the oats and damn…we were SO happy with how this turned out. This recipe is packed with nutrient dense nuts and seeds which seemed to keep us full for a lot longer than my traditional granola. I kept the nuts whole which was a great call because they clustered up nicely on the pan. We sweetened the mixture with some local honey and jazzed things up with plenty of spices for an extremely flavorful morning treat. This granola tastes great with whole milk yogurt, almond milk, or simply by the handful. Try it topped on some vanilla ice cream for a tasty dessert or even sprinkle some on your peanut butter toast for added crunch. So good! Preheat the oven to 300F and position a rack in the middle. Line a baking sheet with parchment paper and set aside. In a large bowl combine the coconut, nuts, seeds, salt and spices. In a small saucepan over medium heat add the honey, oil and vanilla. Bring to a low simmer, stirring occasionally, until the mixture is easily pourable, about 1 minute. Drizzle the honey mixture over the nuts and seeds tossing well to coat. Spread the mixture onto the prepared baking sheet and bake, stirring once halfway through, until golden brown and crisp. About 25 minutes. Let the granola cool completely before storing in an airtight container. Granola should keep for 2 weeks. 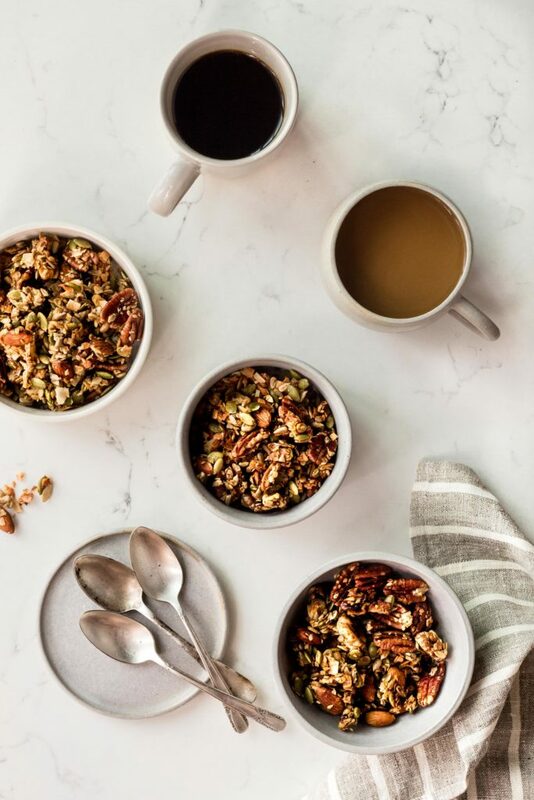 Granola’s my favourite breakfast of all! Love this healthy mixture! This looks wonderful but I have a quick question…do you grind your flax seeds or keep them whole? I kept my flaxseeds whole.I hope that’s helpful! Feel free to tweak this recipe (along with all my recipes) to suit your personal preference though. Happy baking!